Available in Single or Dual button. Select your desired option above. 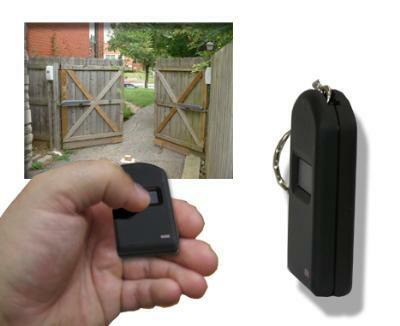 "The GateCrafters P219-1K single button mini-transmitter is a must for your gate opener. It’s simple, reliable, and convenient. It goes right on your key chain and is the same size as most car alarm remotes. The idea is that you will never be locked out because as long as you are driving your car the remote is there. Full sized remotes can be removed from vehicles and left elsewhere. One thing we have discovered through testing here at GateCrafters.com is although the opener is rated by the manufacturer for 50 feet, in some situations it can even reach up to an impressive 100 feet from the receiver depending on conditions.